The trick is that you have to brush your teeth correctly. And almost no one does. In a 1949 Life magazine ad, a radiant mother squeezes a generous stripe of toothpaste onto her elated son’s toothbrush. “Brushing teeth right after eating is the proven way to help stop dental decay with Colgate Dental Cream,” the ad declares, and the little family seems secure in that knowledge. The toothpaste industry should probably get the credit for the three-times-a-day brushing rule to which many people aspire, says Professor Carole Palmer, G69, who heads the Division of Nutrition and Oral Health Promotion at Tufts School of Dental Medicine. But more recent research on how often and exactly when to brush tells a different story. 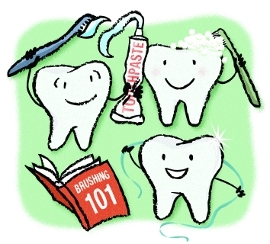 Would you be surprised to learn that instead of three times a day, or even twice, you could get away with brushing just once a day? You probably know that tooth decay and gum disease are caused by the acids released by the bacteria in our mouths. The bacteria like to hang out in the nooks and crannies of our teeth, clinging to a sticky framework called plaque. But it takes 48 hours for bacteria to form large enough colonies to cause problems. For most people, a meticulous brushing once a day is, in theory, enough to break up the colonies before they inflict damage. The trick is that you have to brush your teeth correctly. And almost no one does. For adults, it means using a soft, multi-tufted brush held at a 45-degree angle aimed at the gum line and brushing with tiny back-and-forth strokes that are almost vibrations. “Hold the brush like a make-up brush, or a paint brush,” says Natalie Hagel, a hygienist and an assistant professor of public health and community service. “If you’re doing it every day it shouldn’t take that much pressure to take the plaque off.” Then roll the brush upwards along the tooth, sweeping away from the gums. You’ll have to hold your brush vertically to really clean the backs of your front teeth. The chewing surfaces will need a thorough brushing, too. If that doesn’t sound like your technique, you’re not alone. People are not perfect, and therein lies the difference between lab science and real life. “The reason you are more likely to be better off with three brushings a day than one is you have three chances to do a good job,” Palmer says. The American Dental Association recommends brushing twice a day, morning and night, again for mostly practical reasons. “You’re likely to be at home near a sink then,” Palmer says. To the same point, recent research has shown that acidic foods and beverages (such as soda, lemons, some fruit juices and even diet soda) soften the tooth enamel, especially when consumed slowly or often. Taking a brush to your vulnerable mouth soon afterward can further erode your teeth’s protective layer. Even Colgate, on its website, admits: “Brushing your teeth right after a meal may not be the good habit you think it is.” The company now recommends waiting 60 minutes after you take your last bite or sip. That said, Hagel advises that everyone would do well to rinse with water after consuming an acidic food or beverage. So what’s the bottom line on when to brush? “When you’re most likely to do it,” Hagel says. “Same with flossing.” If you’re inclined to floss before brushing, do it then. If you’re more apt to do it while sitting at the computer checking your e-mail, go for it. The caveat is that people, aside from being imperfect, are individuals. They grow plaque at different rates. Your hygienist may give you specific recommendations on when and how frequently to brush based on your particular mouth. And Hagel still recommends brushing after any sticky, sugary treats. Sorry, kids. Is Once Enough? – Tufts Journal.